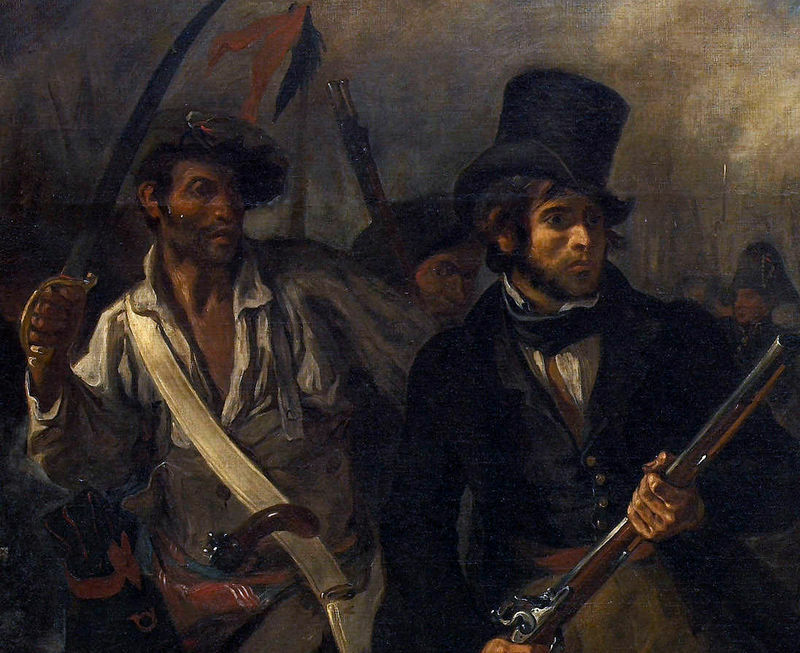 The July Revolution of 1830 was an event that Delacroix simply had to paint. He felt it was his duty as a painter to record this event as the revolutionists felt it was their duty to fight. Delacroix's fascinating colors control the composition and combined with his intense brushstrokes create an unforgettable canvas. The figure of Liberty dominated the composition; as she leads the charging people trampling over the corpses beneath them, she commands attention. The brightly colored flag she handles forces the eye directly to the center of the canvas. The red - a direct diagonal to a half-naked corpse - floats just over the revolutionists. The action is congested, mainly taking up the lower portion of the canvas with a concentration spilling over to the center. The background and righter-most portion of the canvas remain mostly desolate, engulfed in the clouds and smoke of the cannons. Delacroix has created a pyramid structure with Liberty as the peak and the dead soldiers on the ground as the base. This seemly unimportant, and maybe unnoticed, configuration provides balance to the dramatic and busy scene. This pyramid technique achieves balance in this busy composition. Delacroix's use of color in this painting is certainly notable. The bright red, white and blue of the flag at the center of the canvas lead the eye on a journey. 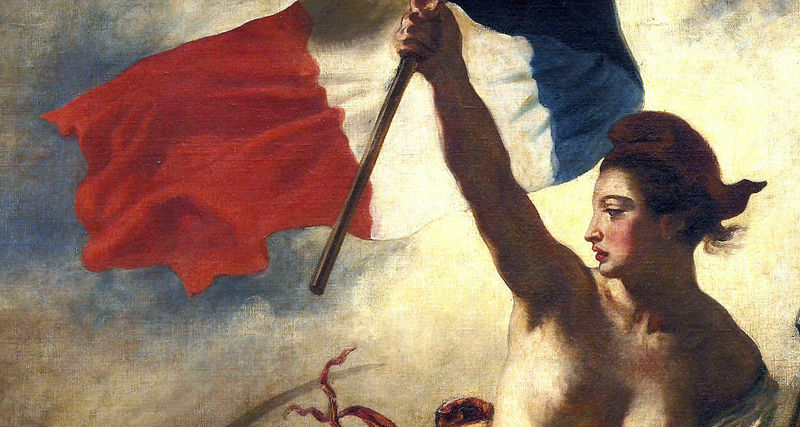 Delacroix echoes this same color scheme just below the flag on the clothing of the man reaching for Liberty. His sash is red and a white shirt peaks out from a blue jacket. 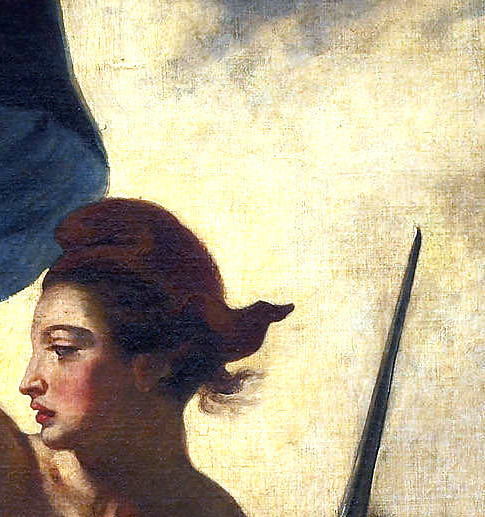 The colors of the flag are not used just for aesthetic pleasure; they represent France and the Revolution. The fighters are united with Liberty. The yellow of her dress is the same yellow of the knotted scarf of the wounded man raising himself at the site of the heroine. 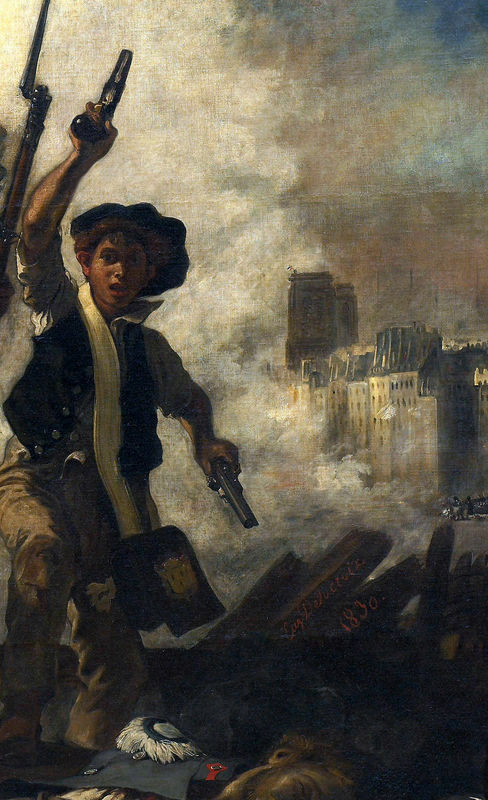 The red belt and peasant smock represent the contemporary workers of Paris. 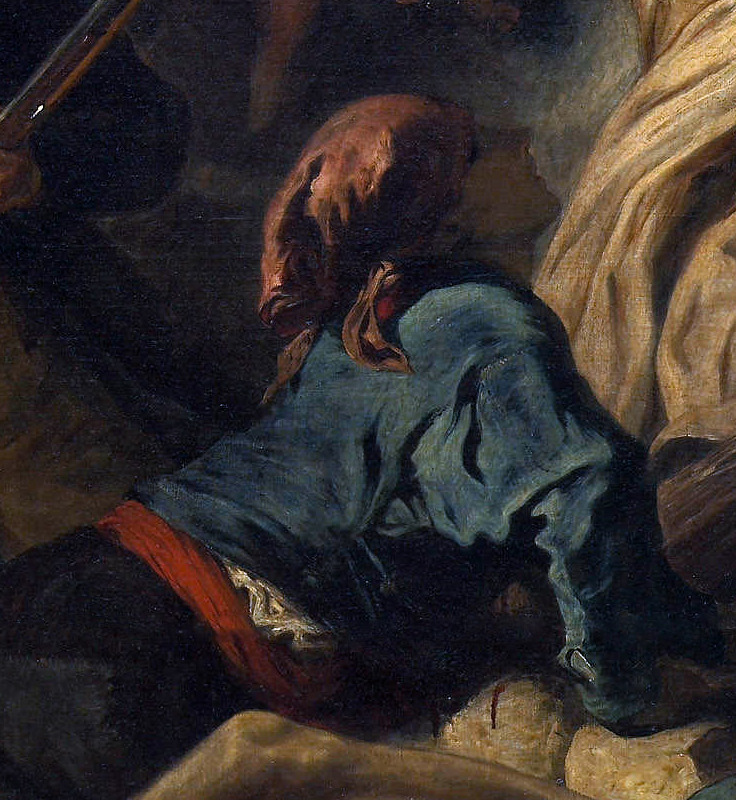 The color of clothing also varies between the other characters in the painting. Differentiating between the people was important to emphasize that all classes and creeds combined in this revolution to achieve a common goal. For example, the man in the black top-hat, bowtie and waistcoat is obviously of a more wealthy economic standing than the factory worker next to him. Delacroix uses light delicately and sometimes sparingly in this canvas. To illuminate the heroine, a halo from the smoke of the cannons and the sunlight forms around Liberty's head emphasizing her power. Light drips onto the slain fighter below her in an effort to remember those who fought for Paris. Liberty leading the people conjures up feelings of power, freedom and victory. The Parisians are unstoppable; they unite and fight, led by the glorious and allegorical Liberty. 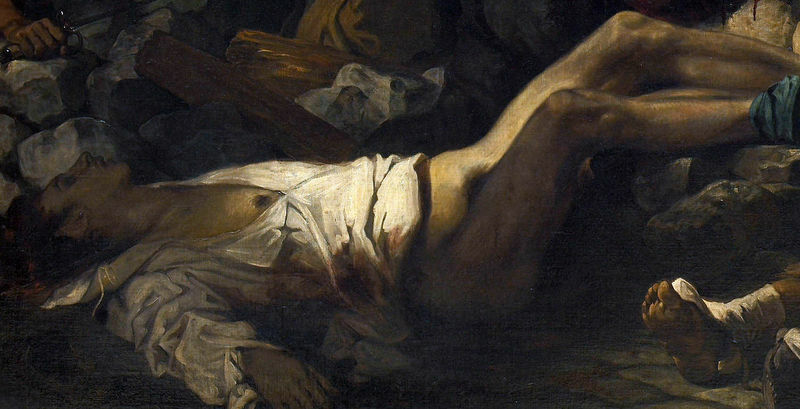 Delacroix makes sure not to forget the dead and he emphasizes their important role - the viewer understands that victory was achieved only through the loss of lives. The emotional rhythm of Delacroix's brushstroke seemed to be central in his originality. In its diversity one can see long and large, continuous strokes as well as small, divided, independent ones. Such techniques had a great influence on the Impressionist and Post-Impressionists, particularly van Gogh and Cezanne.